If a new theory turns out to be true, the universe may not have started with a bang. In the new formulation, the universe was never a singularity, or an infinitely small and infinitely dense point of matter. In fact, the universe may have no beginning at all. "Our theory suggests that the age of the universe could be infinite," said study co-author Saurya Das, a theoretical physicist at the University of Lethbridge in Alberta, Canada. According to the Big Bang theory, the universe was born about 13.8 billion years ago. All the matter that exists today was once squished into an infinitely dense, infinitely tiny, ultra-hot point called a singularity. This tiny fireball then exploded and gave rise to the early universe. The singularity comes out of the math of Einstein's theory of general relativity, which describes how mass warps space-time, and another equation (called Raychaudhuri's equation) that predicts whether the trajectory of something will converge or diverge over time. 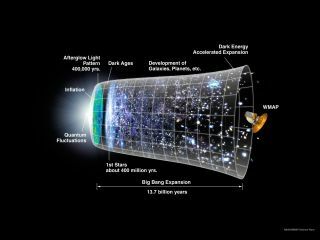 Going backward in time, according to these equations, all matter in the universe was once in a single point — the Big Bang singularity. But that's not quite true. In Einstein's formulation, the laws of physics actually break before the singularity is reached. But scientists extrapolate backward as if the physics equations still hold, said Robert Brandenberger, a theoretical cosmologist at McGill University in Montreal, who was not involved in the study. "So when we say that the universe begins with a big bang, we really have no right to say that," Brandenberger told Live Science. There are other problems brewing in physics — namely, that the two most dominant theories, quantum mechanics and general relativity, can't be reconciled. Quantum mechanics says that the behavior of tiny subatomic particles is fundamentally uncertain. This is at odds with Einstein's general relativity, which is deterministic, meaning that once all the natural laws are known, the future is completely predetermined by the past, Das said. And neither theory explains what dark matter, an invisible form of matter that exerts a gravitational pull on ordinary matter but cannot be detected by most telescopes, is made of. Das and his colleagues wanted a way to resolve at least some of these problems. To do so, they looked at an older way of visualizing quantum mechanics, called Bohmian mechanics. In it, a hidden variable governs the bizarre behavior of subatomic particles. Unlike other formulations of quantum mechanics, it provides a way to calculate the trajectory of a particle. The upshot? In the new formulation, there is no singularity, and the universe is infinitely old. One way of interpreting the quantum correction term in their equation is that it is related to the density of dark matter, Das said. If so, the universe could be filled with a superfluid made of hypothetical particles, such as the gravity-carrying particles known as gravitons, or ultra-cold, ghostlike particles known as axions, Das said. One way to test the theory is to look at how dark matter is distributed in the universe and see if it matches the properties of the proposed superfluid, Das said. "If our results match with those, even approximately, that's great," Das told Live Science. However, the new equations are just one way to reconcile quantum mechanics and general relativity. For instance, a part of string theory known as string gas cosmology predicts that the universe once had a long-lasting static phase, while other theories predict there was once a cosmic "bounce," where the universe first contracted until it reached a very small size, then began expanding, Brandenberg said. Either way, the universe was once very, very small and hot. "The fact that there's a hot fireball at very early times: that is confirmed," Brandenberg told Live Science. "When you try to go back all the way to the singularity, that's when the problems arise." The new theory was explained in a paper published Feb. 4 in the journal Physical Letters B, and another paper that is currently under peer review, which was published in the preprint journal arXiv. Follow Tia Ghose on Twitter and Google+. Follow LiveScience @livescience,& Facebook & Google+. Originally published on Live Science.